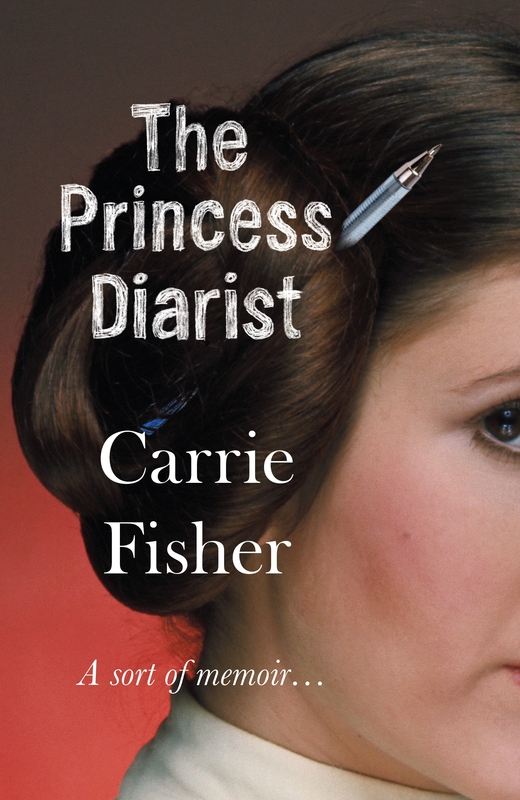 The cover for The Princess Diarist states that it is a “sort of memoir”, this is because the book deals with Carrie Fisher’s show business life before the unexpected mega-hit film Star Wars, her diaries from the period she was on location filming that film, and how Star Wars affected her life afterwards. In a way this is a themed autobiography written by the same author but with one part written forty years ago. The memoir drops a few surprises: Carrie, due to firsthand observations of an actor’s working life, did not intend to enter show business let alone become an actress. The working life was too precarious and fame, while long lingering, didn’t bring financial reward. Both her father and mother were object lessons in those regards. But somehow an acting career happened. Another surprise was that Star Wars was a low budget movie. None of those involved expected the film to be a hit – making a profit (as with any studio film) was all that was expected. The film was made in the United Kingdom because that was cheaper than shooting it in Hollywood. Then there was the affair or prolonged one-night stand as Ms Fisher sometimes calls it. Ms Fisher writes about it in retrospect; and the diaries cover her emotional experience of it at the time. The diaries cover the experience of a very outgoing extrovert nineteen year old unexpectedly having feelings for a very taciturn introvert of thirty three. Not a life affirming experience if the diaries are anything to go by. And yet Ms Fisher stills likes Mr Ford – this is not a cruel book. Carrie Fisher has an easy, engaging style and finds herself an endless source of amusement. The parts before and after the diaries are told with a gentle wit and these parts are a stunning stylistic contrast to the diaries. This memoir is a must read for any fan of the Star Wars film(s) and sheds a valuable light on the person played the character and the character Princess Leia. Put it on your to buy list right now. 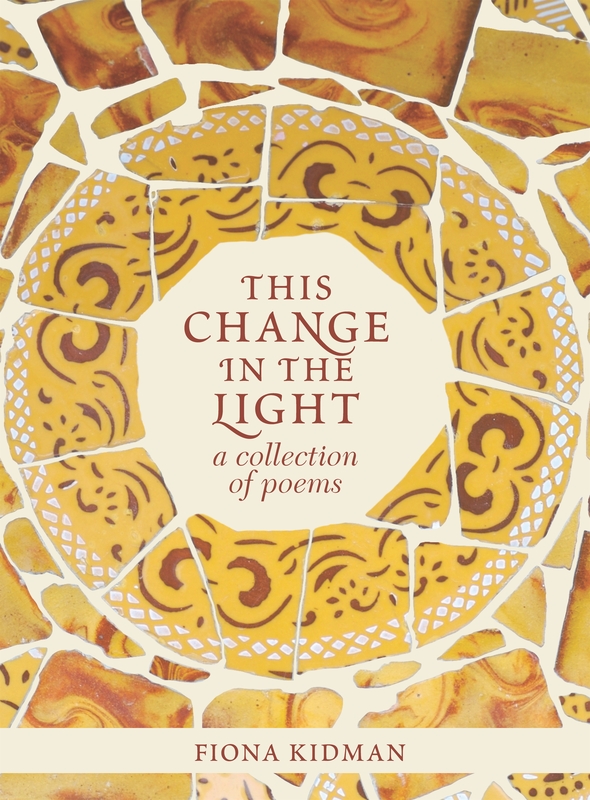 A companion volume to the best-selling Where your left hand rests, this is a personal, autobiographical collection of poems from one of NZ’s top writers. These well-crafted poems are rich in descriptiveness and invite the reader into Fiona Kidman’s life, sharing family, friends, and places she loves with the sonnet sequence being illustrated with family photos of the poet’s mother. They touch our own experiences, giving relevance and insight to our memories. The very attractive little book has a golden mosaic dust jacket and an attached red ribbon to mark your place. It has stunning artwork and is a pleasure to read. I must confess that I haven’t actually read any of Riordan’s work before, although I had seen the movie adaptation of Percy Jackson & the Lightning Thief. Which hadn’t really impressed me, so I wasn’t expecting a lot from this novel. But I soon discovered otherwise. What didn’t come through in the movie is the sheer exuberance of Riordan’s prose, and his truly wicked sense of humour. This book was fun! There were a few things that didn’t sit well with me – the convoluted logic it took to get a Muslim girl to become a Valkyrie for example (just because Muslim heroines are fashionable doesn’t mean that every story has to have one). And I think that the choice of Boston as the centre of Yggdrasil and the connection to the other worlds was yet another case of “everything must happen in America even if it doesn’t make much sense”. Personally, I would have found Iceland a bit more interesting. Or even Norsewood. 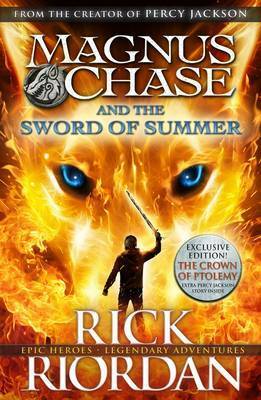 But Riordan is good enough that this reader can ignore such matters and enjoy the story. It does begin in Boston where Magnus encounters a bridge, a sword, and a fire giant. And dies. And the story continues in Hotel Valhalla. Much of the humour devolves from the collision between Norse myth and the modern world, and it worked for me. Much better than other takes on modernising Norse myth that I’ve encountered, and Riordan’s version is much truer to the actual mythology than, for example, the Marvel version. The main criticism others have made is that Magnus is too much like Percy and Jason. I didn’t have that issue, because I hadn’t read the other books. However, I would suggest that if Riordan is to silence his critics, he might be advised to try something totally different after finishing this series – something that doesn’t involve mythology, and has a markedly dissimilar lead character. Maybe a science fiction series with a female protagonist. As for me, I got a lot of enjoyment from this book, and I’m sure many teens would enjoy it too. I’m finding this to be a remarkably useful little cookbook, for all its slim size and unpretentious design. 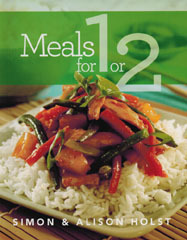 These are real recipes for real food that an ordinary person would actually cook. It’s the kind of book you could give a teenager leaving home to go flatting, and know that they’ll be able to make themselves something to eat that will be cheaper and healthier than a takeaway. None of that upmarket middle-class trendy food here. Just proper New Zealand grub. I’ve already tried several recipes (and many others were already kitchen standards – I know how to scramble eggs, but I’m happy to see recipes like that in the context of a book for inexperienced cooks). The sausage-meat squares made an excellent dinner, and though the salmon cakes were a little dry, that was probably my fault. But it’s good to see cheap and easy store-cupboard recipes like this. For example, instead of calling for vast quantities of expensive maple syrup just to make a cake, the Holsts explain how to create a passable imitation, to go with their French toast. Most of the recipes are for two servings, but there are lots of suggestions and variations, and many of these dishes can be easily reheated, so one for now and one for later. So, I’d call this an excellent choice for novice cooks, especially if they’re on a budget. It’s a great book for the student, in more ways than one. The story of the newspaper The New Zealand Times and the town it was printed in is told by Matt McPherson. A delivery boy for the newspaper his family founded, Matt gives us an oversight of easily colonial life and the challenges it posed. He then outlines the gold rushes, World War 1, the Depression, World War 2, and the effects on the town and its people. Matt’s narrative continues to the changes in society, up to the digital world of online news and the current time. 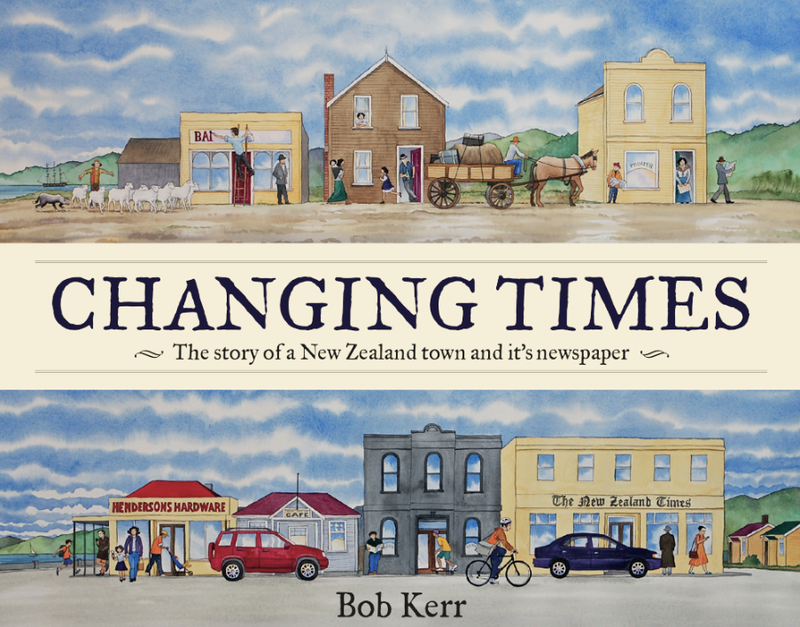 This a fascinating look at NZ’s history and easy to read with a graphic novel layout. The illustrations are attractively detailed and the language is simple to understand. This book was written by the creator of Terry Teo, the popular NZ series, and will delight any child. He created an interactive blog for this story which features many links to NZ history and is well worth checking out.